Treasure Stack is a game that features a new spin on a classic formula. Treasure Stack puts a fantasy spin on the familiar falling block genre of games like Tetris and adds elements of platforming games to create a monster all its own. 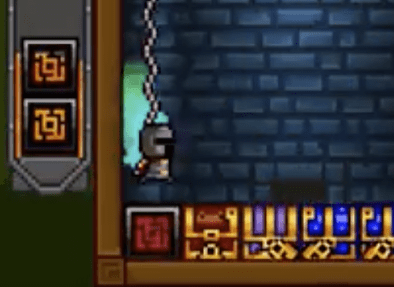 Treasure Stack separates itself from other falling block games in many ways. The first and most obvious way is by implementing a platforming element of controlling a character on the screen as opposed to controlling the falling chests. By controlling the character you can run, jump and using weapons like grappling hooks, bombs and swords to aid you in your quest to match as many treasure chests as possible. But merely matching the various different colored blocks in stacks won’t solve your problem. You must also match the colored chests with a key of the same color to clear them from the screen. This can lead to some major strategy issues, as you often times find yourself waiting for a key of a color that may never come. The ability to pile chests in stacks and move them around the screen adds another layer of strategy to the mix. By jumping you can place chests under you. This ability can come in very handy when you are attempting to keep your stacks from reaching too high into the sky. Falling treasure chests and keys aren’t your only concern though. If you take to long match and unlock your chests black blocks will be randomly tossed into the mix. These blocks cannot be removed with keys. They are present only to keep you from being able to make tidy stacks of chests for removal. As in any falling block game speed plays a huge factor in Treasure Stack. In the beginning, chests fall at a fairly manageable pace. As you move deeper into the round the speed picks up. Combining the speed of the chests with the need for keys, and the black bricks cluttering up your space provides for a challenge that is unexpected when looking at the game from afar. It is a challenge though that can be extremely fun if you’re willing to play in multiplayer mode. Multiplayer mode is the key mode of Treasure Stack. While the game has a solo mode it is bare bones, to say the least. Multiplayer mode pits you against other players to see who can unlock the most chests. It also affords you with some sweet loot in the form of new characters and grappling hooks to be used in the game. The online play was smooth for me and matchmaking seemed to be solid. I was never pitted against someone who I felt was leagues above me in skill. The pixel art in Treasure Stack is fun and colorful. It really works well for this style of game. The character designs are fun and add to the fantasy theme of the game. The sound is solid but doesn’t really do anything memorable. All in all, the presentation elements of the game are nice. Treasure Stack is a fast-paced fun game that seems tailor-made for a system like the Nintendo Switch. While I’m sure it holds up just as well on Xbox One and PC, it’s the type of game that is perfect for a handheld to help kill time on a commute. If you are a fan of falling block games like Tetris or Dr. Mario, Treasure Stack is a game that should definitely be a part of your collection. It is a unique title that does a lot of things right and has that addictive, one more turn nature.